Declining bee populations have been widely covered in the news. 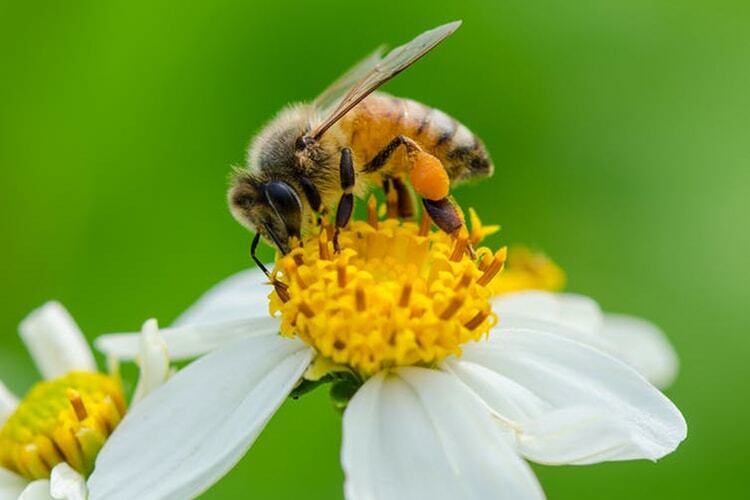 It is a pressing issue worldwide as one in three bites of food that we eat relies on bee pollination. A key factor that affects bees is increasing urban development as people flock to cities. As cities develop, they sprawl into their surroundings, fragmenting animal habitats and replacing vegetation with hard surfaces such as concrete and asphalt. Insects, including a multitude of native bees, rely on soil and plants for foraging and nesting. Bee habitat and foraging opportunities become smaller and more distant from each other. These segments of green space have become known as “habitat patches,” disconnected pieces of habitat that animals can move between to achieve the effect of a larger ecosystem. These patches occur in cities and can take the form of ravines, parks, gardens and so on. Despite the fact that pollinators such as birds, bees and butterflies are better at moving between patches than less mobile species, a continuous habitat is always preferable. Green roofs are seen as a way to make up for ecological habitat fragmentation. But studies and guidelines about where and how to best construct green roofs for pollinators are just emerging. Though domesticated bee species such as the well known European honey bee (Apis mellifera) tend to receive greater attention when it comes to declining population, wild bee species are often found to be even more threatened. Wild bee species are most commonly “solitary” as opposed to “social” and nest in the ground or in existing cavities, not hives. Of the 20,000 or so known bee species, 85 per cent or more are solitary. Rapid urbanization, through paving extensive areas of our environment and loss of vegetative cover, is having a widespread harmful impact on their habitat. Cities are beginning to recognize the importance of creating and enhancing healthy habitats for pollinator populations that support resilient ecosystems and contribute to a rich urban biodiversity. The City of Toronto is in the process of developing a pollinator protection strategy intended to raise awareness, develop new education and training, evaluate and invest in green spaces, as well as re-examine city maintenance practices. Green roofs are mentioned in the protection strategy as one way cities can compensate for the loss of ecological habitat and provide valuable foraging opportunities for urban wildlife. Research on the topic of green roofs as pollinator habitats has been fairly limited, but with cities like Toronto adopting bylaws that mandate green roof implementation, there’s an opportunity to study what design decisions are most critical to their success. Green roof planting choices have been shown to play a part in attracting specific bee species. Sedum species, which are drought-tolerant succulent plants, have always been the most popular choice for green roofs due to their hardiness under extreme conditions, long flowering period and low maintenance requirements. In fact, in Toronto, a great majority of green roofs are planted with sedum. Research by Scott MacIvor, an assistant professor of biological sciences at U of T Scarborough, and colleagues at the Green Roof Innovation Testing Lab (GRIT Lab) shows that when individual native bees visited sedum, their pollen loads contained other herbaceous flower sources, whereas non-native bees had more full pollen loads of sedum more often. These findings suggest that if the majority of green roofs are planted strictly with non-native sedum varieties, it could result in a lost opportunity to bolster precious habitat for native pollinators. It’s important to note that roughly 92 per cent of Toronto’s bee species are native. So, favouring non-native plants can provide habitat for non-native bees over native bees, and could consequently lead to increased competition for those native bees. Despite many green roofs being opportune places for bees to inhabit, research has shown that the location of the green roof matters. The higher the roof, the fewer bees were found there. Green roofs implemented above the eighth storey would not benefit from any additional nesting resources or attract bees. This doesn’t mean that green roofs atop skyscrapers are useless, but that they should focus on other benefits such as rainwater retention, air quality improvement and thermal cooling. In large cities like Toronto, many new high-rise buildings are being built with a “tower and podium” configuration, whereby the first few floors of the building have a wide floor area, often covering most of the block (podium), and the tower is set back from the edge of the building. The roof of the podium is often used as communal space for the building’s occupants and presents a good spot for a biodiverse green roof that could serve bees’ needs. The study further shows that a decline in green space area within a 600-metre radius around each rooftop results in decreasing species richness (diversity) and abundance. Therefore, those designing pollinator habitats on green roofs should consider green space in the surrounding landscape and other features outlined in the City of Toronto guidelines for biodiverse green roofs. Though the appeal of planting green roofs with sedum is evident, limiting the plant palette solely to sedum species could be a lost opportunity to promote native plant and pollinator species in urban environments. At its worst, this practice could cause non-native bee species to have a leg up on natives as both groups compete for pollen. It’s important to not only consider plant communities on green roofs, but also the building height and its proximity to other habitat patches to provide as much foraging habitat as possible for bees. We still need new research into nesting opportunities for ground-nesting bees in the green roof growing medium, as well as the connectivity between ground level landscapes and green roofs, to better understand the ecological value of green roofs in sprawling urban regions. Catherine Howell is a research assistant at the U of T's GRIT Lab. Jennifer Drake is an assistant professor of civil engineering at U of T. Liat Margolis is an associate professor of landscape architecture at U of T.